Constructed with proprietary material compounds that ODI has spent over 25 years perfecting, the new Troy Lee Designs motocross grips were developed and tested to perform at the highest level of competition. With reinforced ends for durability and a directional pattern that provides additional traction when the rider pulls back, ODI grips are engineered to win. Designed by Troy Lee Designs. Ergonomic designs conforms to a true riding position. Reinforced ends provide extra protection and prevent grip blowout. Stepped, raised diamond pattern provides slim feel with extra traction. picked these up because I liked the color (not so many choices for a bright medium blue), but found that the composition feels good and works great. If you have small hands and don't want a waffle design, I think you'll really likes these grips. I used the V2 lock on grips from ODI for years and still really like those but figured it was time for a change, i'm glad I did. They have a good amount of rubber on the ends so they don't tear too easily if you go down. Just mad i didn't try these sooner! Ideal grips for people who hate the feeling of half waffle grips. 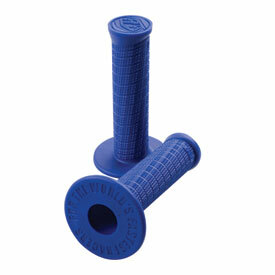 These grips give you the perfect amount of grip, while feeling symetrical all the way around. They last a long time, and do not tear easily when you dump the bike on its side. Good quality grip, easy to install, got the job done. Very comfortable grips I had a hard time getting them to keep from spinning on my handlebars. In my opinion, these are the best grips out. Been running them since they came out. Super soft and comfortable, tradeoff for durability. Definitely one of the most comfortable grips on the market. They are super soft and forgiving on the hands. Of course due to this softness, theybarent the most durable grips. These grips are pretty thin and very tough. They have a nice comfortable feel and are really sticky in all conditions. My son loves them too but I just think he likes the bright colors! Great grips, great price! Put a pink set of these on my wife's Ttr 125. I'm both picky and hard on grips, I prefer a thin grip that keeps the bars feeling narrow. This grips are nice and thin and have a super solid feel and the grip is amazing. To top it off they seem to be purely bomb proof!! Just what I want from grips. Comfort for the long ride while at the same time holding up to abuse. My old grips rubbed my hands raw with the protruding knobs. 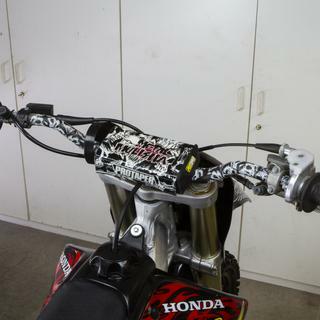 These grips are awesome, no blister problems at all, look slick on my white yzf250. Some wear on the ends after going down a few times but that's to be expected with any grip. Good bang for the buck. Will definitely buy again. Not bad. Like them. First time trying single compound grips and can't complain. Are the white grips softer? BEST ANSWER: I have never used the white grips but I have used several of the colored grips and they have all been the same. Yes the White Moto Troy Lee Designs Grips are the signature edition "Soft Compound"
Yes, the white grips are made with a softer compound.